Click here to PIN THIS simple pumpkin cake recipe! Let’s talk about something that’s real important, k? Lately, it seems super cool to be all anti-pumpkin. I mean, it also seems super cool to be obsessed with pumpkin, which is why the anti-pumpkin people are coming out in full force to say “no, we will not stand for pumpkin spice macaroni and pumpkin spice shoelaces.” But, guys. I’m getting nervous. I feel like we’re about to have a full on Grease-style feud between two rival gangs and it’s stressing me out. Can’t we all just get along? Can’t we all just eat or not eat our pumpkin in peace, like respectable adults? Now, you miiiiiiiight have noticed that I’m on Team Pumpkin Everything. I mean, it’s pumpkin. Why anyone would say no to that is beyond me, but whatever. You do you. So, I’m here, in early September with my second pumpkin recipe of the year. The first one, in case you’ve forgotten, was shared last month. 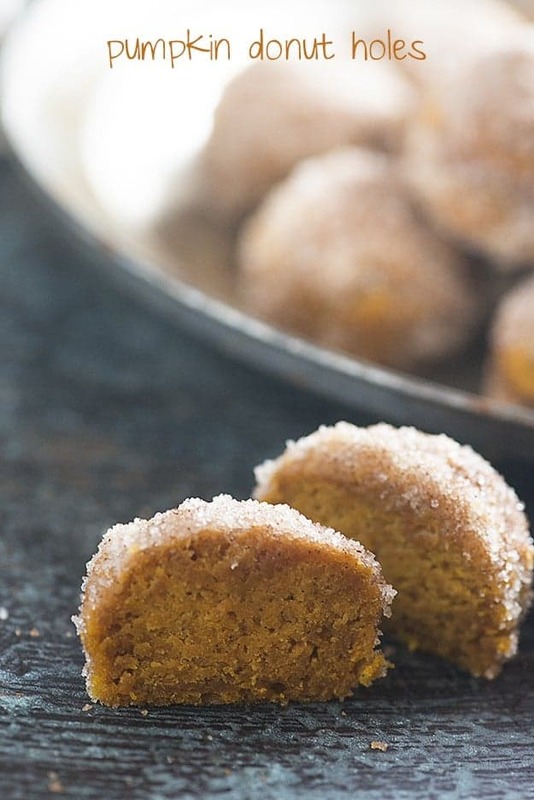 It was pumpkin donut holes and I think you should go make these right away. I’ll wait. Anyway, I’ve shared this Pumpkin Crunch Cake recipe in the past, but I made it again last week and took new pictures. It just confirmed my belief that this pumpkin cake is somehow, magically, even better than traditional pumpkin pie. No, I won’t be serving it in place of pie at Thanksgiving, but on a regular day when I’m craving pumpkin? 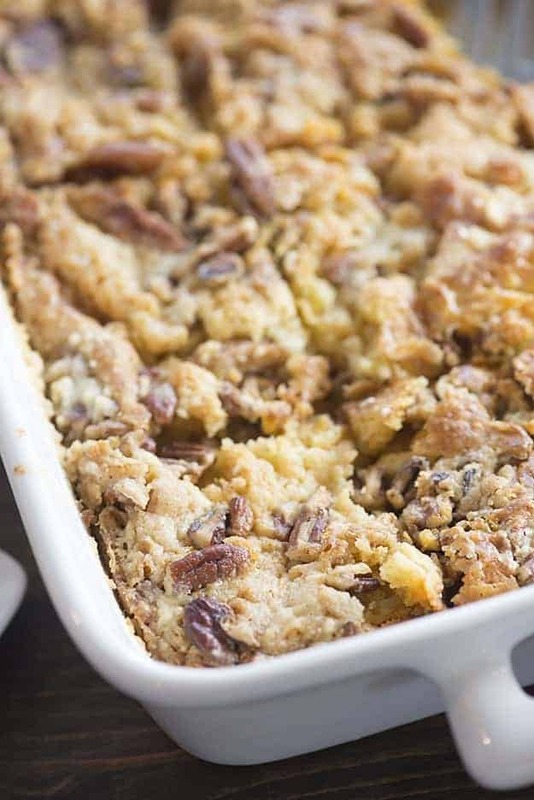 This will do the trick even better than pumpkin pie and *bonus points* it’s a heck of a lot easier to make. I only use half of a box of cake mix in this recipe. I know that’s kind of annoying to have a half packet of cake mix laying around, but you can use it next week to make this again. Trust me, you’ll want to. You could also use the entire bag of mix. It makes this much more cake-like. I like it with a half bag of mix, because the custard-y pumpkin bottom shines through a lot more. Whatever way you make this, I can guarantee that you’re going to love it. I actually finished off this entire pan, piece by piece, for breakfast one week. And dessert. And snacks. I was both happy and sad when it was gone – happy to have a chance to maybe button my pants again, sad because my one true love was gone from this Earth. I store this in the fridge and it sets up nice and thick. In the video above and in these pictures, it was still warm, which is why it fell apart when I scooped it out. It holds it shape perfectly when cold! 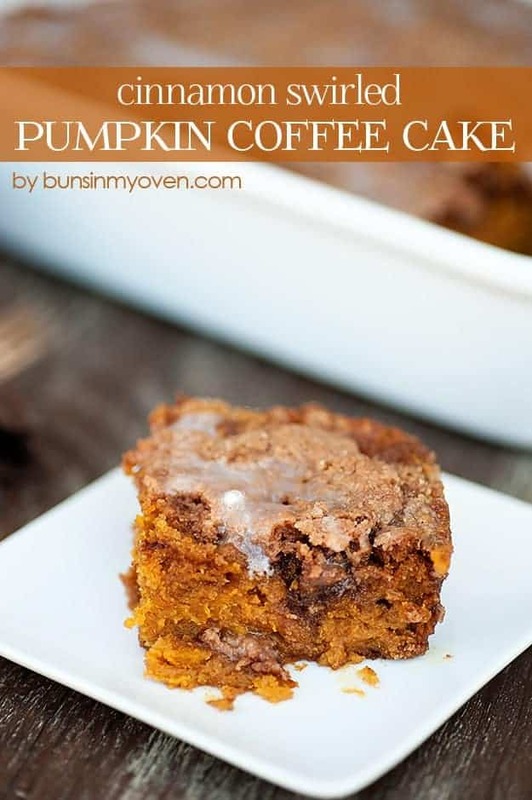 Be sure to also head over to check out my pumpkin coffee cake. It’s packing two full cans of pumpkin and is intensely rich and fudgy. I’m addicted to the stuff. The video lists pumpkin pie spice, but the recipe shows cinnamon, nutmeg, ginger, and cloves. I make my own pumpkin pie spice by using that mix of spices. You can swap in 1 1/2 teaspoons of pumpkin pie spice if you’d prefer. Can I substitute a spice cake mix instead of yellow? Absolutely! I prefer yellow, but many people make this with spice cake. 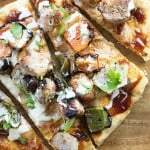 What is the sauce on top in your pictures? I topped this with ice cream and caramel sauce. It’s also good with whipped cream or served plain. I don’t like nuts, what can I substitute? 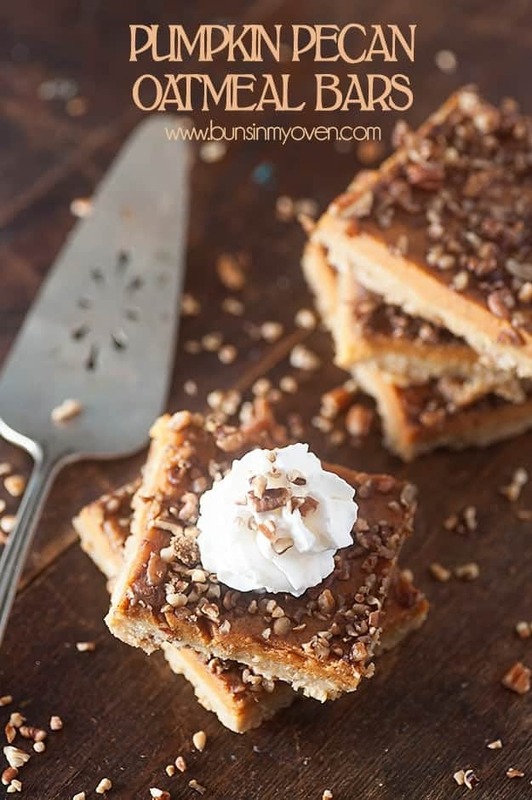 You can skip the nuts entirely or substitute them with graham cracker or Biscoff pieces. Skor bits are also good, from what I hear. 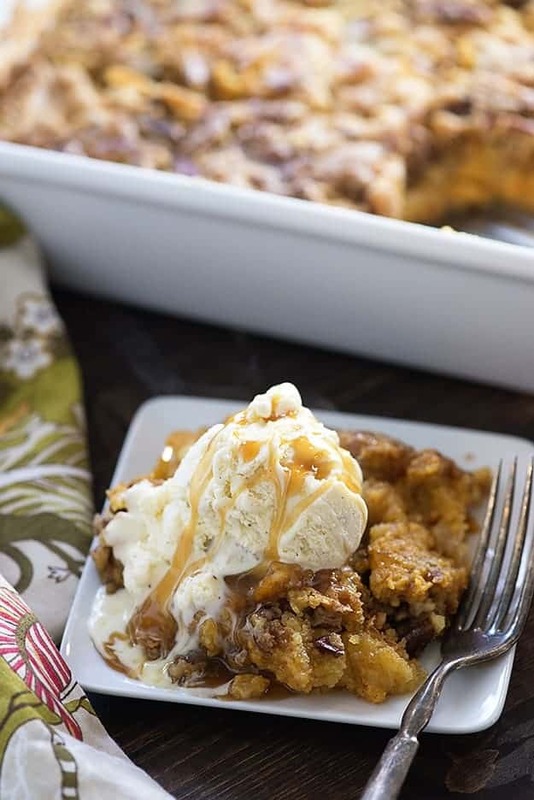 Can I use the canned pumpkin pie filling instead of puree to make this even easier? I haven’t tried it myself, but I imagine it works. 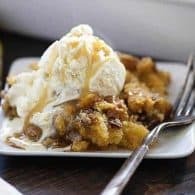 Can I reduce/omit the sugar in this recipe? I’ve never tried it, so I really can’t make recommendations on this. 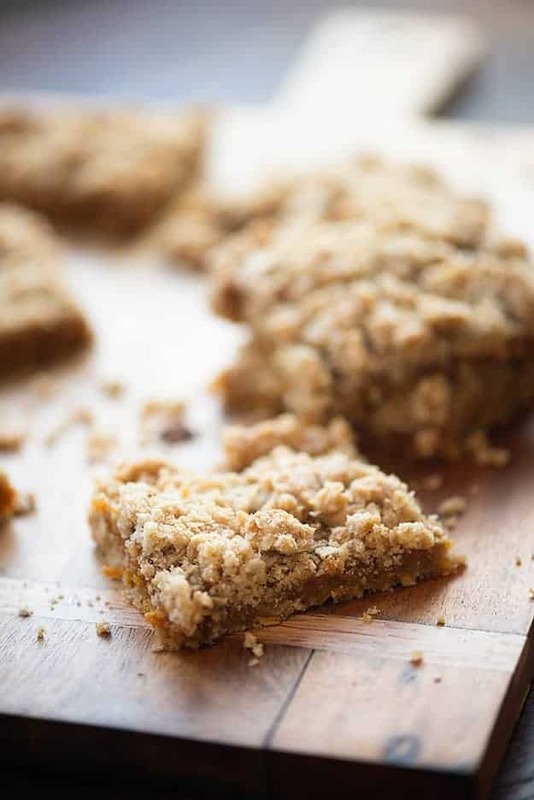 Pumpkin Crunch Cake is the ultimate fall treat. Top with ice cream and enjoy! I wasn’t paying attention and accidentally mixed the cake mix with the pumpkin mix I went ahead and baked it without putting the butter on top I was afraid it wouldn’t blend together. It’s baking now I hope it still tastes ok. Do you have any suggestions for this mistake in case someone else does this? Hi Danna! Hope it turned out okay for you. I don’t have any recommendations for this. It tastes fine not as good if I did it the right way next time I won’t do 3 things at once when baking. 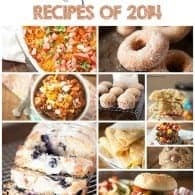 I am so thankful for your simple videos and recipes they have truly changed my families life. 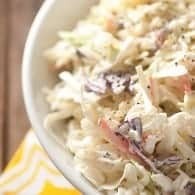 Can this be made in the crock pot instead of oven? I’ve never tried this one in a slow cooker. I wish the recipe clarified for the non-bakers out there whether or not it should have unsalted or salted butter. Chose the wrong one…..sadly. I prefer salted butter on this, but either work fine. If you’re sensitive to salt, you can certainly use unsalted. The salt will give you a salty sweet flavor that I love, hence cutting the sweetness. The times I’ve used unsalted butter, I’ve found that the sweetness is a bit overbearing. If reducing your salt intake I would suggest half salted butter and half unsalted butter. What do you think about putting this in a crock pot? Maybe 4 hours on low? Mike, did you try it in the crockpot? And if so, how did it turn out? It sounds like it would be a great option for this. I think it would work, but I’m not sure how long it would take. Any suggestions for substituting out the cake mix? 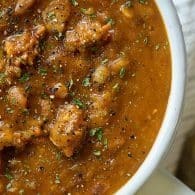 Have you ever tried this in the instant pot? I just made this and doubled the amounts to have anough for all the pumpkin lovers in the family. It came out wonderfully and I’m not a pumpkin aficionado and I enjoyed it. The spices are not overwhelming but just right. Thanks for this one. Did you use 9×13 with doubling ingredients? I’m curious if it would be fine to just use 1c sugar? Thats just too much sugar for me. I think I’ll just try the 1c and see. I’m interested to hear how it was only using 1 cup sugar. That is what I was thinking of doing. If you use 1/2 the box of cake mix, could you use 1/2 the amount of butter? Nope, I don’t think that would work. There wouldn’t be enough butter to cover the top of the cake mix and it’d turn out very dry and crumbly. I’ve made this with less sugar for those who were asking: don’t do it! It did not taste as good as the original recipe- very bland .use all the sugar called for. Trust me on this. Thank you so much for this recipe! I can’t wait to make it again! 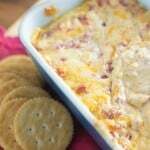 Is this something that you can make ahead of time and freeze? Has anyone tried that? I really want to make this but I’m out of butter. I do have a butter yellow cake mix. Would coconut oil work? Hmm, I think it might but haven’t tried it myself. Hi, can I leave it out overnight or does it have to go in the fridge right away. Do you think this would be okay with fat free evaporated milk? I think so, but haven’t tried it to say for sure. 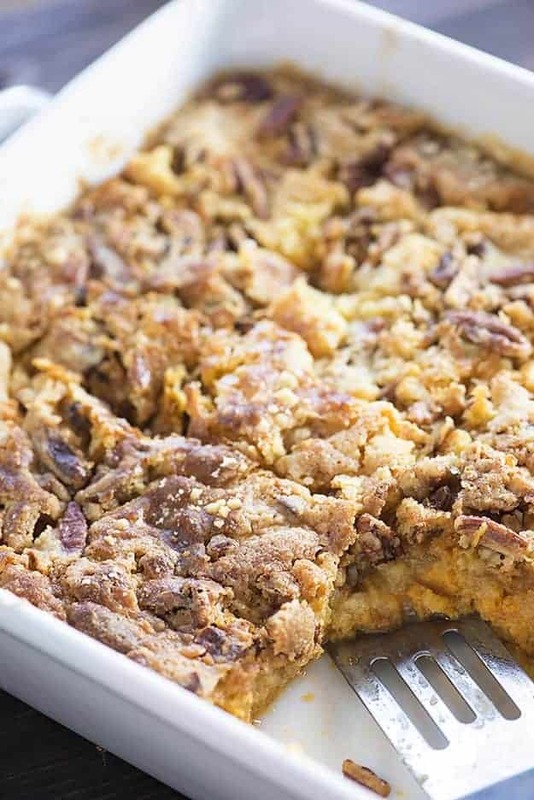 I have to tell you that this is the absolute BEST pumpkin-anything recipe out there! I love pumpkin, especially pumpkin pie, but I can’t make pic crust worth eating. I’m even bad at using the pre-made crusts! When I found this recipe a couple of years ago, I just HAD to try it and I fell in love again, and again, and again! Thank you so very much for giving us this delicious recipe! 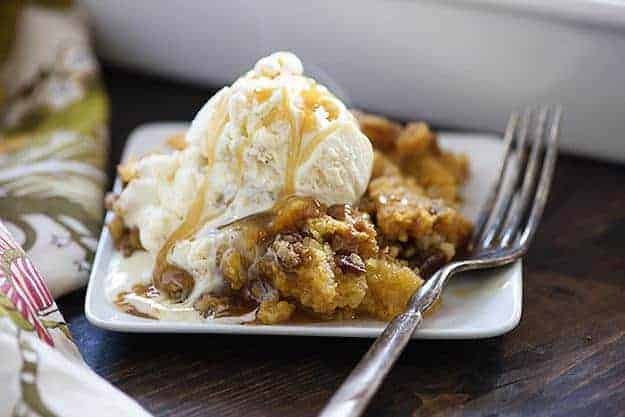 Can you make this split in two pans? I have two 8×2 round cake pans. I’m wondering what the cook time would be? I’m sure you could, but I don’t know how it will change the bake time.